A flood is a general thing. Tornadoes are idiosyncratic, fires depend on their fuel, mudslides are site-specific, and so it goes. Sure, not everyone is in the flood plain and the other natural disasters can cause a lot of damage, but somehow a flood seems the most comprehensive of them all. Noah wasn’t asked to build a firebreak, and even today a flood can look as though it might cover the earth. This photograph from a farm within reach of the Mississippi River shows how a flood brings everything under the singular dominion of water. It’s not as if nothing is left, but everything is inundated, either covered or cut off and then suspended in the same elemental medium. As you can see here, the structures may remain intact (for awhile, anyway), but everything else is swept away or drowned. 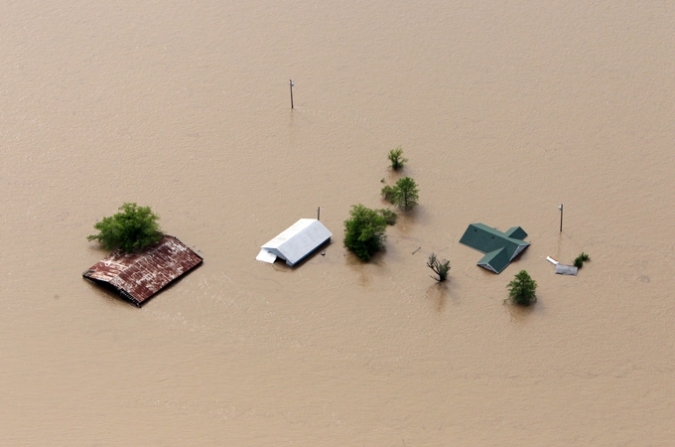 The dunning uniformity of a flood’s destructiveness is depicted perfectly by this photograph. One result is that it becomes easy to see the disaster as a general problem, something that affects the whole community and is defined by collective action such as building dikes. That’s not the full story, of course. In fact, you are also looking at a personal disaster: this farmer is effectively wiped out for the year or worse. House, place of business, equipment, everything has been ruined, and don’t even think about getting the crop planted in time. Likewise, the waters that look so uniform from a distance will be a silent maelstrom of cross currents, fish, other animals, and debris, and the waters will reshape the land this way and that before they recede. The particulars are not the story, however, nor should be. The flood, both materially and symbolically, is one way that nature reminds us of how things that seem separate can share a common fate. Which is why disaster relief will flow like waters from the federal government to the states. Of course, it flows regardless: after the tornadoes that ripped through the South last month, and after the hurricanes and every other natural disaster. The federal largess is particularly interesting this year, since–as often is the case–most of the damage is in so-called Red States. That’s right, in the states where majorities pride themselves on their commitments to small government, low taxes, and deficit reduction. And so the photograph above needs to be paired with the pictures that you won’t see: (1) Red State governors not applying for or accepting federal aid. (2) Red State governors, senators, and representatives saying that they don’t want any aid if it would increase the deficit. (3) The same crew saying that they will be willing to raise taxes or increase deficits to cover their own disaster needs, much less others’. (4) Anyone realizing that low taxes and deficit refusals are automatically denying aid to those who are experiencing disaster elsewhere–including economic disasters and social disasters such as bad schools and unsafe neighborhoods. (6) Any suggestion that we should ask those citizens with low state taxes to rely on their tax savings to cover the costs of the disaster. (7) Any suggestion that we should rely on market solutions: say, in line with health care revisionism, that the afflicted states should bid for the aid, with the lowest bidder winning while the other states are free to apply for help from other countries. Hypocrisy is a necessary part of democratic politics, but there ought to be limits. Unfortunately, the Red State politicians will ask for every penny that might be available and scream if they don’t get it, and do so without a thought to changing their relentless assault on federalism. They should be helped, of course, but they also learn the lessons that disasters have to teach: lessons of reciprocity and other forms of cooperation on behalf of the general welfare. That’s how human beings have been able to survive. If you look at the photograph above, you might begin to understand how cooperation is the way that we can match nature’s comprehensiveness. Photograph by David Carson/St. Louis Post-Dispatch. I think Chomsky’s “selective amnesia” is more appropriate as in my experience, such people aren’t pretending, they fully believe that what the say and do make sense.